NOTD: Angelica nail polish in Holiday Fun and Love You. To go with the purple makeup look I was wearing on Sunday (which you can see here in my first FOTD - as an aside, I'd love to know what you think of these posts. Yay, nay or couldn't care less?) I decided to wear these Angelica nail colours I picked up in Penneys for, well, pennies...€2.75 per bottle, to be precise. These are the first polishes I've tried from the range and I was pretty impressed. Holiday Fun is a lovely bright reddish purple - I want to call it magenta - with a blue microshimmer. I think the photo above captures it quite well, you can see the magenta colour clearly around the sides of the bottle, with the bluish shimmer making it look almost lavender up there towards the bottle cap. It went on nicely in two coats. I went for an accent nail by adding two coats of Love You to the nail on my ring finger, on each hand. Love You is a lovely, vibrant, hot pink glitter and I thought these colours went really nicely together. They only lasted a day without chipping, despite a topcoat, but overall I was still pretty happy for the price and I'm planning to pick up a gold glitter that also caught my eye. Have you tried any Angelica polishes yet? Oh I love these colours, lovely and bright. I bought some Angelica polished but haven't tried them yet. Fun colours - and those shades are all in for the Autumn. Does it chip off easily though Em ? Thanks guys! Angelica have some really great colours alright. Joanne, I applied the polish on Saturday evening and by Sunday night a few nails had chipped a little at the tips. By Monday evening it had chipped a little more and needed to be removed. I'm hard on nail polish though so it may last longer on somebody else! 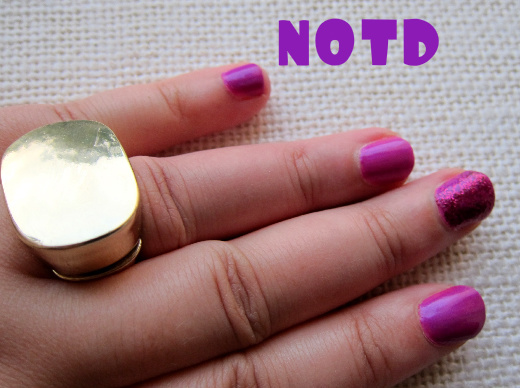 Great NOTD and I lovelovelove FOTD posts!! !